Is your elderly parent living alone? Many seniors dread the thought of moving into a nursing home. Read this simple guide to help your parent continue to live independently. Independent living means to live alone, generally in one’s own home or at a retirement village. Seniors choose to live alone because they are used to their home, familiar with neighbours and nearby shops, have memories there, love their independence and dislike changes. They may have lost their partner or may be helping to care for them. Usually, they believe themselves to be capable of living alone, both physically and mentally. While your parent is living independently, you will worry about their health and safety. However, when you express concern, it’s likely that they will simply say “I am fine. No need to worry about me”. They’ll remind you that they have been living independently for years and assert that nothing needs to be changed. Is the home designed to suit an elderly person? The layout of the house will need to be functional and easy to access, enabling your parent to walk around safely and smoothly. Minimize furniture and position it in a way that doesn’t interfere with your parent’s movement. Modify the home. Home modification solutions for independent living include: Add handrails around the house to reduce the risk of falls. Ensure that stairway rails are sturdy. In particular, install grab-handles or bars in the toilet and bathroom to allow the elderly to have some support. Add mats that aren’t slippery to reduce the risks of falls. Hire an electrician to install movement-sensing lighting to brighten corridors and bathrooms automatically at night. Replace locks with safe but simple lock mechanisms, and modify bathroom doors to open both ways in an emergency in case your parent falls behind the door. Remove kitchen hazards. Ensure that the kitchen doesn’t have anything sharp lying around. Check regularly for any expired foods. Place instructions on each difficult appliance to remind your parent how to use it. Keep hazardous items such as bleach locked away in cupboards, and purchase a plastic kettle that minimizes the risk of scalds. Clean up. Remove any rubbish from the house and garden. Take away clothing and other materials that are no longer or rarely used. Shift power cords and other obstacles to prevent tripping accidents. Are they capable of managing their daily activities? This may include eating, dressing, bathing, walking, going to the toilet and getting on/off the bed. These are activities that aren’t fundamental. This may include taking medication, using a telephone, cooking meals and grocery shopping. Determine what they can and can’t do independently. Is the environment safe? A video doorbell or door camera can be installed for your parent to see who’s ringing the doorbell outside and to help prevent strangers from entering. Ensure that the doors and windows are locked to help block intruders from gaining access. Medical Alert Button. Provide a 24/7 panic button such as a bracelet or pendant button to allow your parent to gain help in case of an emergency. Train them to use the button and test with them regularly. Falls and illness. Provide a walking aid and simple seating before they are required. On the wall above the telephone, place a list of emergency contacts. Help arrange for regular medical check-ups including podiatry and dental care, which seniors often neglect. Depression. Seniors living independently are at huge risk of boredom, social isolation and loneliness. As a health risk, social isolation is a major problem – even worse than smoking and obesity – and can double the risk of depression. Medical Research shows that only face-to-face contact, at least 3 times per week, specifically with family and friends, can reduce social isolation and halve the risk of depression. Do you visit your elderly parent at least 3 times each week, or are you too busy with your own work and family life? Do you live far away? Is it hard for you to visit often? A regular phone call can help you worry less, but won’t make up for the lack of face-to-face contact. We can help. 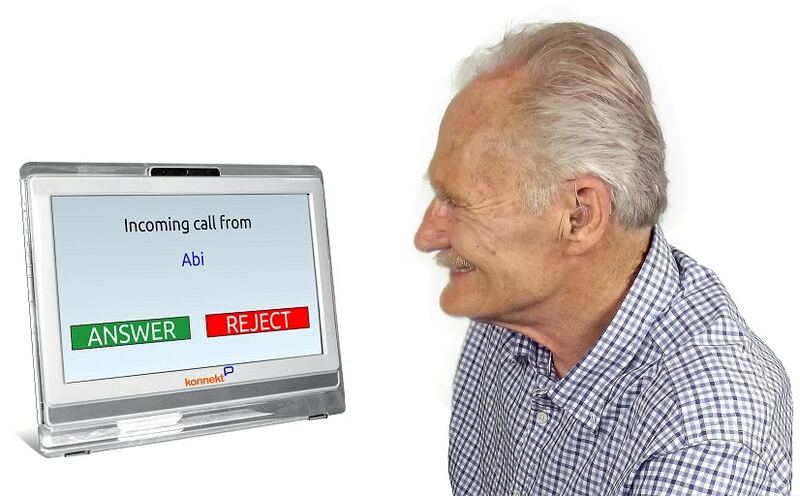 Konnekt Videophone for Independent Living. 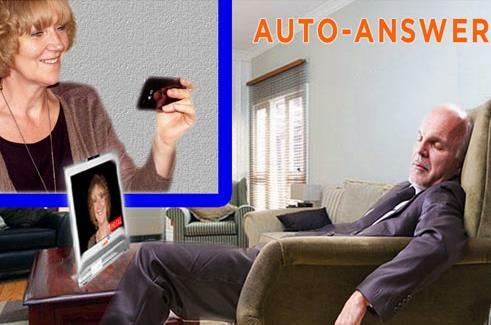 Sons/daughters can see visual changes to their parent’s condition, or if they’ve fallen or fallen ill.
Find out more about Konnekt Videophone or contact Konnekt to learn about our Videophone.